During the first of three student cruises, the team aboard RV Falkor answered questions about whales’ decision-making process about how and where whales feed in the deep sea,while providing invaluable at-sea experience for students. The focus was deep-diving toothed species found in Hawaiian waters—beaked, short-finned pilot, and endangered sperm whales. While extensive work has been done throughout most parts of the world to study whale migrations and concentrations, much less work had been done to understand the factors that control these migrations. 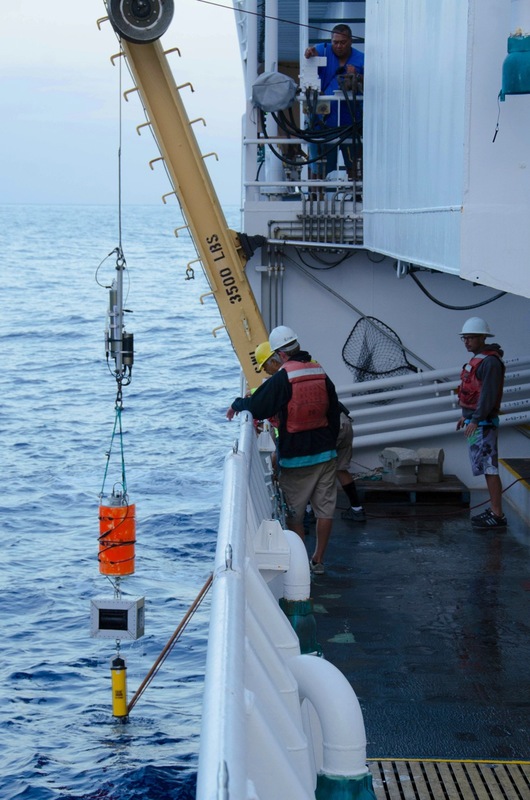 This cruise included two projects focused on that topic with student team members from the University of Hawaii at Manoa (UH), the Hawaii Institute of Marine Biology, and the National Oceanic and Atmospheric Administration (NOAA). Adrienne Copeland, a Ph.D. zoology student at UH, was chief scientist for the cruise to the waters off the Kona Coast on the west side of the Island of Hawaii. She built on past work, using sonar to learn more about where whales feed. Toothed whales, known formally as odontocetes, sometimes dive down 1,000 meters or more, complicating the job of studying what attracts them and what holds their foraging attention. Copeland used sonar to track diving whales and quantify how much food is available in the areas where they spend their time during dives. Her hypothesis was that whales may be targeting places where prey is particularly abundant within or below what’s known as the deep scattering layer. The deep scattering layer (DSL) is a layer at which smaller fish, crustaceans, jellies, and other organisms tend to concentrate. During the day, this happens in deep waters below the reach of sunlight, where these smaller animals retreat to the relative safety of darkness to avoid predators. But many feed on algae in shallower waters, so each night about half of the organisms collectively move to shallower depths under the cover of darkness. This daily movement up and down constitutes the planet’s largest migration. Studying all of this took a few components. First off, students stood watches on the observation deck during daylight hours looking for whales. This helped the team target areas for research. They also toke photos of the whales they spotted for use by NOAA researchers in ongoing programs that identify individual whales and track their movements using a photo database of the animals’ unique dorsal fins. To expand on observations the students also lowered hydrophones to confirm that their target whale species are eating in the area based on the whales’ characteristic echolocation clicks. In areas where the whales congregated, the team ran surveys using Falkor’s advanced fisheries sonar system. In this case the system used acoustic signals to map the location and concentration of the deep scattering layer. The students also ran these sonar surveys in areas where they didn’t find whales for comparison. And at various locations the team collected water samples at different depths using the ship’s CTD rosette. Ultimately Copeland analyzed the results to see if in fact DSL concentration can be reliably tied to where the whales are found. This finding could aid whale conservation efforts by identifying areas that migh require increased protection. Complementary research during the cruise by Giacomo Giorli, an oceanography Ph.D. student at UH, elucidated more of the story that Copeland was working to tell. Giorli’s work focused on figuring out more specifically what aspects of the deep scattering layer might be most attractive to foraging whales. The idea was that diving several hundred or even a thousand meters down uses up a huge amount of energy, so the payoff must be comparably huge. To make the effort worthwhile, whales must either get lots of small fish and other animals on a single dive, or an equivalent volume of food from larger animals. Giorli’s hypothesis was that the whales are going after larger squid that aren’t necessarily a component of the DSL but might be attracted to it for their own feeding. 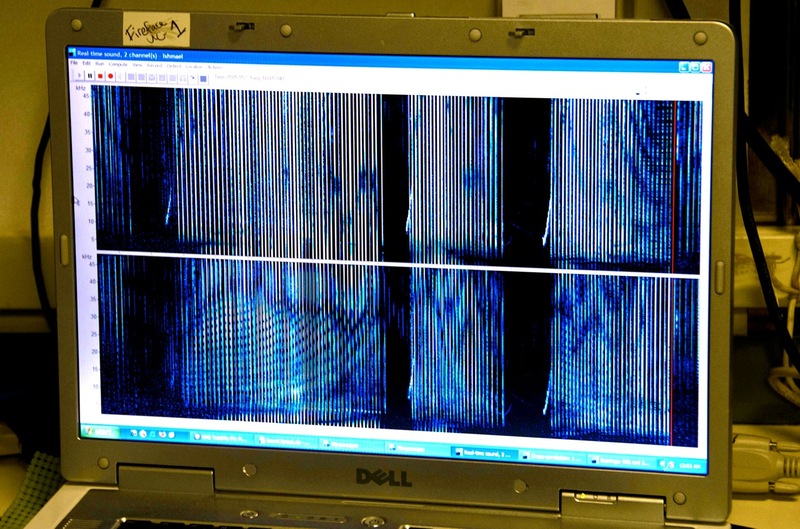 Giorli used a tool called a Dual-Frequency Identification Sonar (DIDSON). He worked with other students and the crew to lower the instrument over the side to get much higher resolution information than normal sonar systems provide. The DIDSON produces remarkably detailed sonar images that look almost like video and make it possible to identify individual organisms underwater, even from 30 meters away. The system is most frequently used for applications such as tracking fish moving up rivers. For this cruise, Giorli used it to identify things like squid in or below the DSL, and he was also be able to learn specifics about the size, number, and types of other animals found there. Besides correlating DSL data with the areas where the whales are directly detected or observed, the team also was able to tie information about DSL structure and inhabitants in various spots with a longer-term record of whale locations. For about a year, the team had two Ecological Acoustic Recorders (EARs) deployed in the area where they worked. These acoustic listening devices recorded the whales’ clicks, which enables tracking. They also were comparing all their findings on this cruise against past work to look for any seasonal differences in the whales’ behaviors. 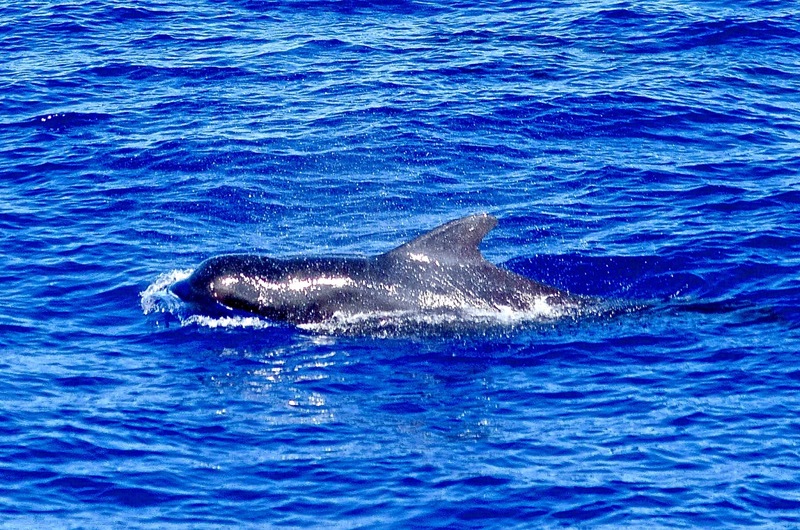 A short-finned pilot whales, one of the three species that will be the focus of the expedition. A map of the expedition's planned work area, off the west coast of the Island of Hawaii. 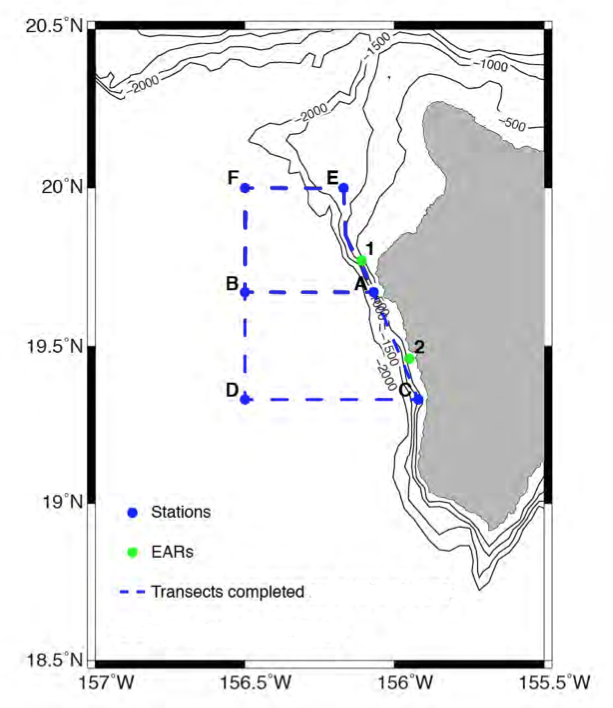 A hydrophone map of locations for a group of short-finned pilot whales based on their echolocation clicks. The multibeam data from this cruise can be viewed through the NOAA National Center for Environmental Information (NCEI) map viewer. You can view all Falkor datasets by using the Filter Surveys button in the left sidebar.